Football season is almost here! 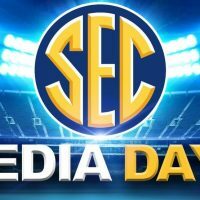 Fox Sports Shoals is hitting the road, bringing you all access from SEC Media Days presented by North Alabama Honda Dealers. Join us live from Atlanta everyday 3 to 6 starting Monday. Jordan Campbell and Chuck Hammer bring you the interviews and insights from coaches and players. SEC Media Days presented by North Alabama Honda Dealers along with Mabe Heating & Cooling, Cornerstone Flooring, Alabama Awnings, Florence Pharmacy, National Advance Auto Sales, Tennessee River Rental, University Chrysler Dodge Jeep Ram Fiat, Contender Boxing & Fitness, Allstate Agent B.J. Brewer, and JC Hamm & Sons. Live on Fox Sports Shoals 97.9 FM and 1340 AM or download the WSBM app to listen on the go. Fox Sports Shoals, where sports beats music!